For conurbations as well as cities, see List of urban areas in Denmark by population. The largest urban area is the Hovedstadsområdet, the metropolitan area of Copenhagen. ^ Percentage increase or decline from 2006 to 2016. Vallensbæk communes, Ishøj by og Greve Strand and parts of the Ballerup and the former Søllerød and Værløse municipalities. ^ As of 1 January 2008, Aarhus merged with Jegstrup and Tranbjerg. ^ As of 1 January 2011, Aarhus merged with Stavtrup. ^ Since 1 January 2007, Bullerup og Seden are included in Odense. ^ As of 1 January 2010, Odense merged with Højby and Stige. ^ a b From 1 January 1981 to 31 December 2005, Nørresundby was included in Aalborg. On 1 January 2006, the urban area definition was introduced and Aalborg's and Nørresundby's population are again calculated separately. ^ Since 1 January 2007, Haslund, Over Hornbæk and Paderup are included in Randers. ^ Since 1 January 2010, Trørød and Brådebæk are included in Hørsholm. Since 1 January 2008, Øster Sandbjerg is included in Trørød. ^ Since 1 January 2009, Espergærde is included in Helsingør. ^ Since 1 January 2007, Snoghøj is included in Fredericia. 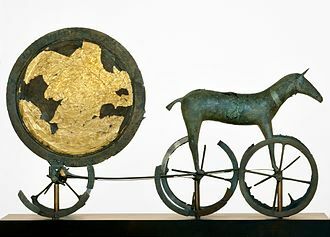 ^ Since 1 January 2012, Hald Ege is included in Viborg. ^ Since 1 January 2007, Mejrup Kirkeby is included in Holstebro. ^ Since 1 January 2010, Stenløse is included in Ølstykke-Stenløse. ^ Siden 1. januar 2011 medregnes Stilling til Skanderborg. ^ Separate cities up to and including 2012. ^ Skovby had a population of 2.706 i 2006. 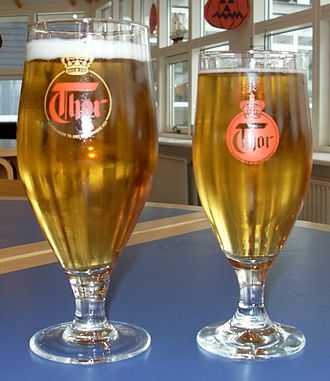 ^ Since 1 January 2007, Godthåb is included Svenstrup. ^ Since 1 January 2010, Dronningmølle is included in Hornbæk. ^ Danmarks Statistik (12 April 2011). Nyt fra Danmarks Statistik Nr. 171. Stadig færre bor i landdistrikter (PDF). ^ a b c d Danmarks Statistik (1 October 2007). Nyt fra Danmarks Statistik Nr. 415. Seks ud af syv danskere bor i byer. Odense is the third-largest city in Denmark. It has a population of 175,245 as of January 2016, by road, Odense is located 45 kilometres north of Svendborg,144 kilometres to the south of Aarhus and 167 kilometres to the southwest of Copenhagen. Odense has close associations with Hans Christian Andersen who is remembered above all for his fairy tales and he was born in the city in 1805 and spent his childhood years there. There has been settlement in the Odense area for over 4,000 years, although the name was not mentioned in writing until 988. Canute IV of Denmark, generally considered to be the last Viking king, was murdered by peasants in Odenses St Albans Priory on 10 July 1086. Although the city was burned in 1249 following a royal rivalry, in 1865, one of the largest railway terminals in Denmark was built, further increasing the population and commerce, and by 1900, Odense had reached a population of 35,000. Odenses Odinstårnet was one of the tallest towers in Europe when built in 1935 but was destroyed by the Nazis during World War II, the University of Southern Denmark was established in 1966. In the present day, Odense remains the hub of Funen. Several major industries are located in the city including the Albani Brewery and GASA, Denmarks major dealer in vegetables and flowers. In sports, Odense has a number of clubs including OB, BM, B1909, and B1913, the Odense Bulldogs professional ice hockey team. Odense is served by Hans Christian Andersen Airport and Odense station, Odense is one of Denmarks oldest cities. Archaeological excavations in the vicinity show proof of settlement for over 4,000 years since at least the Stone Age, the earliest community was centred on the higher ground between the Odense River to the south and Naesbyhoved Lake to the north. Nonnebakken, one of Denmarks former Viking ring fortresses, lay to the south of the river, Odenses Møntergården Museum has many artefacts related to the early Viking history in the Odense area. The Vikings built numerous fortifications along the banks to defend it against invaders coming in from the coast. The first church in Odense appears to have been St Marys, the territory, previously part of the vast Archbishopric of Hamburg, was created a Catholic diocese in 988. Skanderborg is a town in Skanderborg municipality, Denmark. Just north of the town on the side of Expressway E45, is the archaeologically important Illerup Ådal. Over time, the town has grown into a suburb of Aarhus to the north east, connected by the areas of Stilling, Hørning. Skanderborg is home to a population of 18,506 citizens, the municipality is part of the larger East Jutland metropolitan area, with 1.2 million inhabitants. Skanderborg is an old town and the area have revealed traces of human settlements, a seasonal camp from the Ertebølle culture, was found here in the 1930s for example, near the former Ringkloster on the southern brinks of Skanderborg Lake. The town sprawled around the former Skanderborg Castle, founded at some point during the early Middle Ages, the town of Skanderborg has attracted several religious communities over the years, especially in the early Middle Ages. The long gone Ring Abbey founded by Benedictine nuns in the 12th century, was situated on the southeastern brinks of Skanderborg Lake. The last buildings burned down in 1715 and now there is a mansion at the site, there used to be a Dominican monastery on the small islet of Kalvø in the middle of the lake. The monastery was founded by the Black Friar Order in the first half of the 12th century, along with a small harbour, the Cistercians came here after they had failed in founding a proper monastery at several nearby locations since 1165. Here they founded Øm Abbey in 1172, the royal residence of Skanderborg Castle was arguably the most important and influential building in the history of Skanderborg, but it was demolished stone by stone during the 18th century. Founded at some point in the early Middle Ages around 1200, King Frederik II had the old medieval castle radically rebuilt and his project was grandiose in scale. An entirely new large Renaissance palace was erected and the park of Skanderbrog Dyrehave was constructed nearby. Stones from the demolished Øm Abbey west of Skanderborg were used as construction materials, many of the original structures survived the project and were incorporated into the new buildings, amongst these the old castle chapel. Haderslev is a Danish town of Region of Southern Denmark with a population of 21,574. It is the town and the administrative seat of Haderslev Municipality and is situated in the eastern part of Southern Jutland. Haderslev is home of Sønderjyske, which is a football team that plays in the Danish Superliga for the 2015-16 season. Haderslev is situated in a valley, leading from Vojens to Haderslev Fjord, Haderslev was presumably founded by Vikings at least a century before it was granted status as royal borough in 1292. At that time, it had one of the main trading centres in Southern Jutland. In 1327, the castle, was mentioned for the first time. It was situated east of the cathedral, an area still called Slotsgrunden, in the following centuries the city prospered, building both the Gothic Cathedral and the second castle of Hansborg, which was similar to Kronborg. Due to the plague in Copenhagen, King Christian IV was married there, in the 16th century, the city became one of the first Scandinavian places to embrace the Lutheran Reformation. 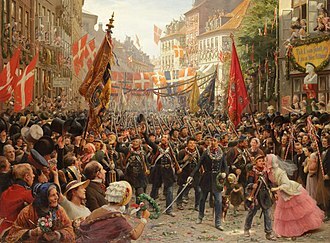 Prior to the Second Schleswig War of 1864, Haderslev was situated in the Duchy of Schleswig, from 1864 it was part of Prussia, and as such part of the North German Confederation, and from 1871 onwards, part of the German Empire. In the 1920 Schleswig Plebiscite that returned Northern Schleswig to Denmark,38. 6% of Haderslevs inhabitants voted for remaining part of Germany and 61. 4% voted for the cession to Denmark and it was formerly the capital of the German Kreis Hadersleben and the Danish Haderslev County. The trademark of Haderslev is unquestionably Haderslev Cathedral, which has existed since the middle of the 13th century, another noticeable church is the white-chalked Sankt Severin Church, which lies at the banks of the towns inner pond. Once the town used to have a castle named Haderslev Hus, in the public park Kløften, near the towns center, Kløften Festival, a three-day annual festival is in the summer. The festival uses one of Haderslevs important trademarks, the water tower near the park as their logo. Skive is a town in Skive municipality in Region Midtjylland at the base of Salling Peninsula, a part of the larger Jutland peninsula in northwest Denmark. It is the main town and the site of its municipal council. 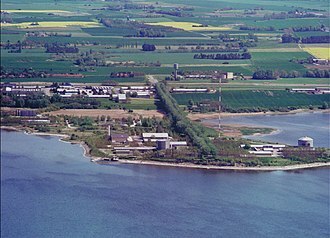 The town of Skive is located at the mouth of the Karup River, Skive has a population of 20,505. 14th century Spøttrup Castle underwent extensive repairs in the 1940s, and opened as a museum, Skive Art Museum is housed in a building designed by Danish architect Leopold Teschl, who designed the Skive Historical Museum. The Art Museum houses a collection of modern Danish art. The collection has works by artists, including Christen Dalsgaard. The Museum has a polar bear, which was donated to Skive by the friendship city of Scoresbysund in Greenland. The Fur Museum is on the island of Fur, part of the Skive municipality and it features exhibits relating to the island, particularly fossils. The Four Boxes Gallery is located in the grounds of the Krabbesholm Højskole, the Mønsted Limestone Caves south-west of Skive are run by Denmarks nature-preservation group, Skov- og Naturstyrelse. Grenaa is a Danish town and seaport on the east coast of the Jutlandic peninsula. Tourism and commerce are important sectors in the economy of Grenaa and it is the only larger town on Djursland. Grenaa is the seat, and the largest town, in Norddjurs Municipality. Grenaa was first mentioned in 1231 and it was granted the status of a market town in 1445. Grenaa has a lingering production industry just as in most of the western world, development of tourism and educational institutions is sought to play a larger role for Grenaa in the future. The 5 km sandy Grenaa Beach is significant for tourism, with a hinterland of summer cottages, including many rentals. Grenaa is a shopping centre for central-eastern Djursland, an about 40 km x 40 km peninsula, protruding into the sea. With 14.601 inhabitants Grenaa is the largest town on the c.40 km x 40 km peninsula, where coastal tourism is important. Djursland has 22 sandy beaches along the three-sided 260 km coastline, with in the order of 7.000 summer-, Grenaa Beach can be seen as the best of the beaches on Djursland, as it was elected as one of the two best beaches in Denmark in 2006. Horsens is a Danish city in east Jutland. It is the site of the council of Horsens Municipality, the citys population is 57,517 and the municipalitys population is 87,736. The municipality is a part of the East Jutland metropolitan area, Horsens is best known for its culture and entertainment events. Horsens New Theatre is a centre which holds over 200 events annually. 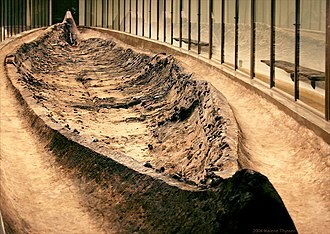 It has managed to draw major names such as Bob Dylan, Horsens lies at the end of Horsens Fjord in eastern Jutland. The city is surrounded by typical moraine landscape with low hills, Horsens is 50 km south of Aarhus and 30 km north of Vejle, and approximately 200 km from Copenhagen. It is believed the name Horsens derives from the old Danish words hors, from the 12th century the name Horsenes is known. The earliest traces of a city are remains of a burial site. In the 12th century, the kings Sweyn III and Valdemar I issued coins in the city, in the 13th century the city got its own legal code. Excavations have shown that the city was expanded around 1300, with a moat going around the city, industrialization started from the middle of the 19th century. Kolding is a Danish seaport located at the head of Kolding Fjord in the Region of Southern Denmark. It is the seat of Kolding Municipality and it is a transportation and manufacturing centre, and has numerous industrial companies, principally geared towards shipbuilding. The manufacturing of machinery and textiles and livestock export are other economically significant activities, with a population of 90,066, the Kolding municipality is the seventh largest in Denmark. The city itself has a population of 58,021 and is the seventh largest city in Denmark, the municipality is a part of the East Jutland metropolitan area with 1.2 million inhabitants. In the Battle of Kolding, fought on 25 December 1658, a battle between German and Danish forces took place near the town on 23 April 1849 during the First War of Schleswig. On 3 November 2004, the N. P. Johnsens Fireworks Factory in the suburb of Seest exploded, one firefighter died,85 people were injured, and around 2000 people were evacuated and some of them lost their home during this disaster in this suburb of Kolding. Located in Kolding is the royal castle of Koldinghus. This was built in the 13th century by King Eric Klipping and is now a museum with certain parts of the castle, including its chapel and hall and it was the last royal residence in Jutland. Another notable site is the 13th century stone Church of Saint Nicholas, popular tourist attractions include the Trapholt art museum and the gardens Geografisk Have. 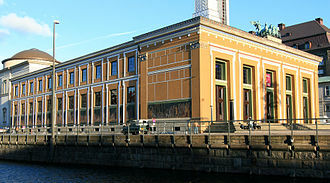 Trapholt holds collections of Danish arts from 1900 onwards and a number of non-Danish exhibits. Kolding is the site of Designskolen Kolding, a university design school, the municipal museum, the Museet på Koldinghus, is located in the castle and former royal palace. It has a collection of Danish art from the late Middle Ages to the 1940s, miscellaneous artefacts of local interest, the Trapholt art museum features many pieces from mainly Danish artists, along with a large collection of chairs. Also Kolding houses the Danish Museum of Nurses which is situated in the reception building of the former tuberculosis sanatorium for children. The castle lake "Kolding Slotsø"
Hjejlen ("The Golden Plover") is a historic steamboat that sails from Silkeborg to Himmelbjerget. In the background can be seen the city's former paper mills, now home to the Radisson-SAS Hotel and other shops. Front façade of Skive railway station. The renaissance version of Skanderborg Castle. Skanderborg Lake as seen from the northeast, with Kalvø and the remaining red brick castle church, once associated with Skanderborg Castle. 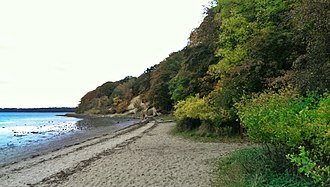 The beech trees behind the church are the outskirts of Skanderborg Dyrehave. 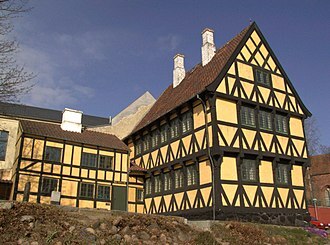 The town museum Mads Lerches Gaard. The 40-metre-long gatehouse Landporten in Nyborg, which was used to defend the town's inner circle during attacks. The old abbey church (Klosterkirken). Church of Our Lady in Kalundborg, Denmark.